Sunmi is now a triple threat to the OH! Chart after gaining a third win with ‘SIREN‘! A legendary soloist and one of the most popular in Korea, Lim Chang Jung, took over the digitals category with his song “There Hasn’t Been A Day I Haven’t Loved You” racking up a total score of 65,653,562 points. Another popular soloist and the previous winner of the digitals category, Roy Kim, made it to second place this time for his song “The Hardest Part” with a total of 48,745,025 points. Sunmi, once again in third place with SIREN, brings in a total score of 41,789,645 points. As for the physicals category, GOT7 takes the lead once again with a grand total of 24,144 copies sold this week for “Lullaby“. Next up is the 10-membered girl group that continues to gain popularity, WJSN, with “Save Me, Save You” having sold a number of 10,108 copies. UNB, the boy group formed through the competition show The Unit, placed third this week with a total sale of 10,043 copies for their album “Black Heart“. Sunmi rose to the top of the user votes category, with “SIREN” totaling 17 votes. The OneHallyu community continuously shows their love and support for GOT7, with 15 votes going towards “Lullaby“. The third place spot for the user votes category has tied once again this week, but this time with Red Velvet’s “Power Up” and WJSN’s “Save Me, Save You” both earning a total of 14 votes! First place on the OH! Chart podium this week goes to none other than soloist Sunmi, with her most recent single “SIREN” earning her a triple crown. Lim Chang Jung takes second place with his song “There Hasn’t Been A Day I Haven’t Loved You“, and GOT7 grabs the rightful third place spot with “Lullaby“! 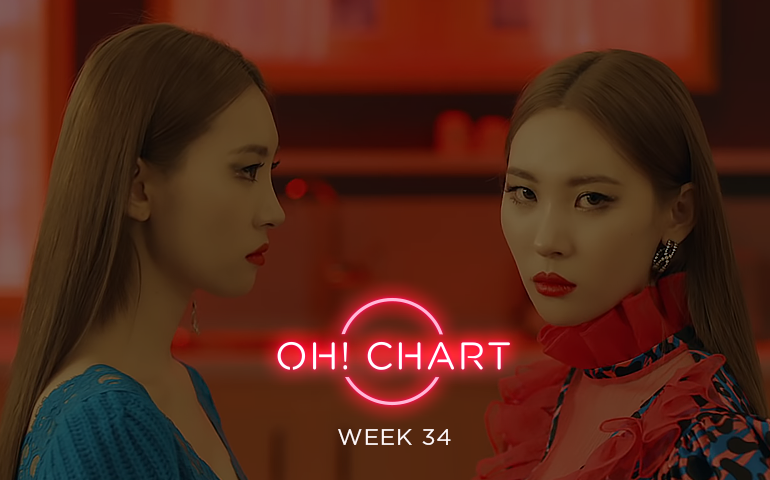 Sunmi made a comeback and rose once again to the top of the OH! Chart podium this week, with “SIREN” earning the soloist her very own triple crown! Who do you think will take the #1 spot next week now that Sunmi is out of the game?